We just got back from camping in October in the Pacific Northwest!! We have totally camped this time of year, a bit more wet that this time though. It’s been a weird time of year, unusually warm and dry. Yes, it rains here, but not too much over Summer. Now that we are in the first weeks of Fall, rain would have come a bit more. It hasn’t until today. So this passed weekend we took advantage of the seventy degree dry weather and went camping. Glorious fresh air, rumbling creek, huge trees, and happy campers! No pun, we had the best time building fires, eating great food, s’mores included, bacon by the fire, can’t get much better. Life is great. I love camping, there is nothing like it. It’s quiet with the sounds of the creek, birds, wind in the trees, and the sweet smell of campfire. We found the best campsite in the area, double in size, off the campsite round about road, right up against the creek. It drizzled the first night we were there, but the giant trees gave us the cover while we unpacked. We stayed a couple of nights, just enough to rest, relax, and reboot. Going into nature makes me happy, it fills me up like a good concert or vacation. There is no internet, no phones, nothing to connect us to the outside world like back at home. While I love my work, I equally love taking breaks. I took two book and didn’t even read them! I simply sat around the fire, made our food, and enjoyed our time together with family. Glorious indeed. Coming home after such a lovely weekend made it easy to make this beautiful and super healthy dish. I felt rested and inspired to make it! I love working with Kelly from Kelly’s Jelly. Her local product makes my life as a recipe developer so easy because it’s the best quality you can find out in the world. Her passion and love shines through her jelly’s and pairing any of them with meats and salmon is my favorite way to use them in our kitchen. 1. Place pepper jelly, sesame oil, and soy sauce in a small bowl, whisk to combine. Place salmon on a plate, pour mixture over salmon. Allow to sit while mixing dressing. 2. Place olive oil, rice vinegar, 1/4 teaspoon fine salt in a large bowl, whisk to combine. 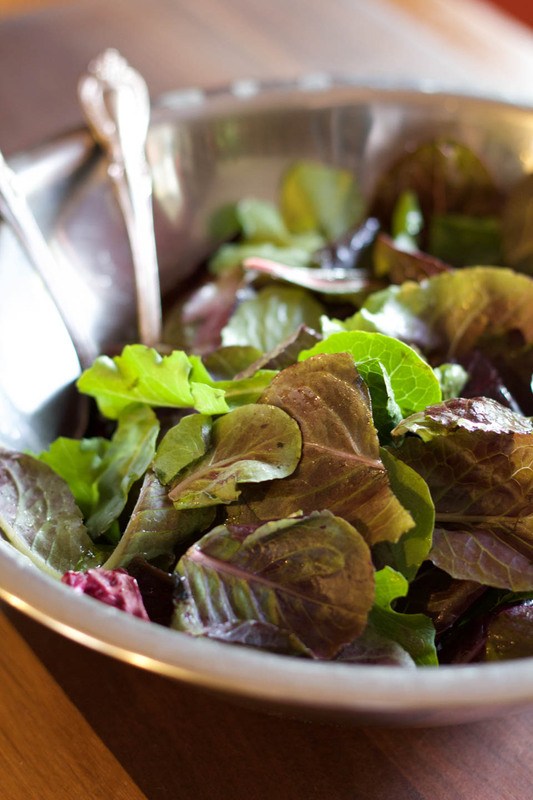 Add mixed greens, toss to combine using tongs or hands. Divide evenly among 2 plates. 3. Heat olive oil in a large pan or cast iron pan over medium high heat. Once oil is shimmering, place salmon in pan skin side down, pour remaining pepper jelly marinade over salmon. Sprinkle each piece evenly with fine sea salt. Cook for 4 minutes uncovered. Using a fish spatula, turn salmon over and cook for 4-5 minutes, or until center is medium. Serve immediately with fresh parsley sprinkled on top of salmon. I’ve got some pepper jelly sitting in my pantry begging to be used and I think I just found the answer. 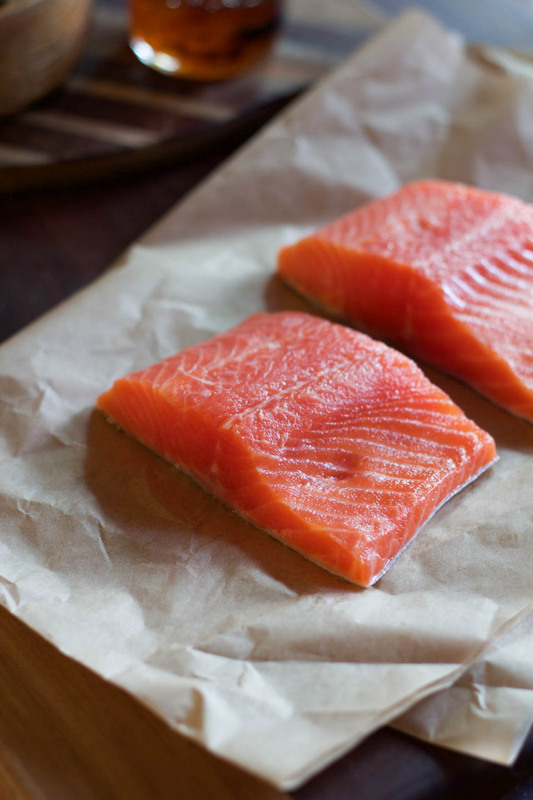 A simple but delicious recipe and I always love new ways to cook salmon. 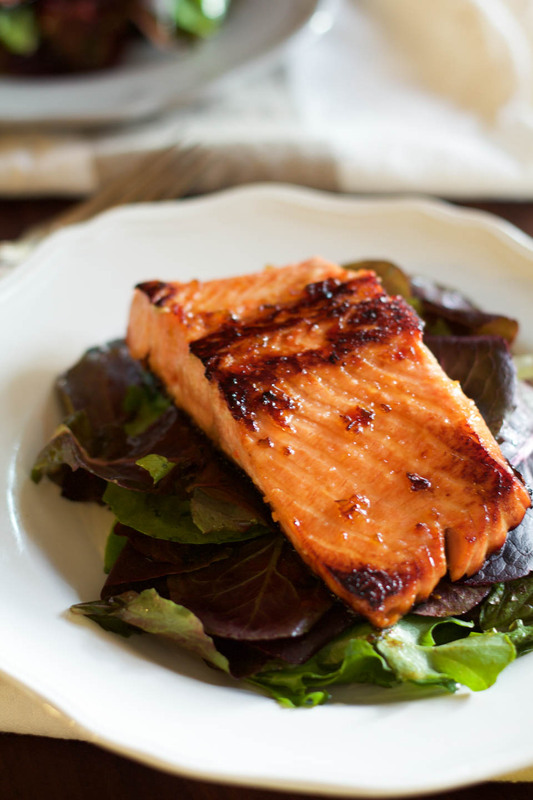 Simple glazed salmon like this is one of my go-to meals. I make it at least once a week. I usually use a combo of apricot preserves and red pepper flakes, but this habanero jelly would be my sweet and spice, all in one jar. Love it! Thank you, Lori!!! Oh such a good call on the apricot preserves, I’ll try it your way :)! Sounds great. What a relaxing camping vacation! I would have totally taken advantage of the great weather too. I also love the use of this spicy jelly on the salmon. It looks perfect! Thank you dear! Come over and we can go camping!!! I need this, in muh belly NOW! 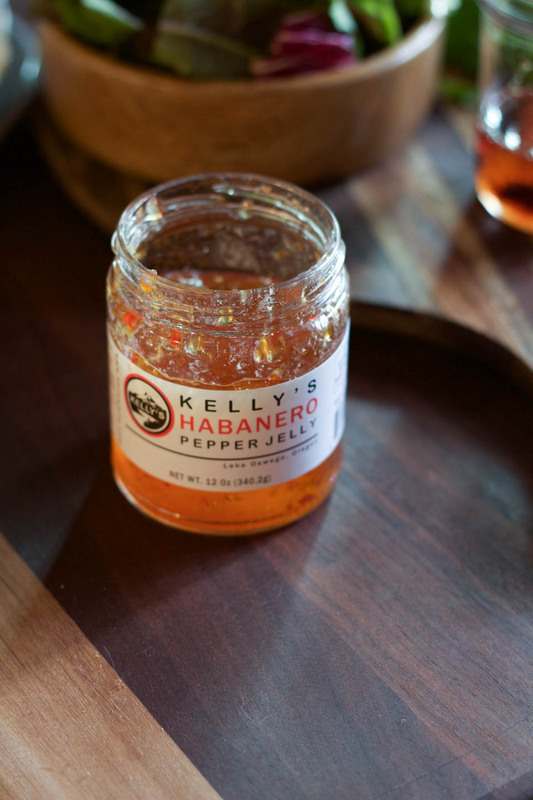 We love spicy pepper jelly, and this is such a great way to use it! Such an easy recipe, and so full of great nutrition and flavor. Beautiful served over mixed greens! I’m not much of a camper (I B&B), but I’ll go camping with you! That PNW trip sounds divine as does this salmon dish! Mmm spicy jelly, love it. Come on over!!!! I’m only 35, but the older I get, the more I want an rv or cabin lol!!! This salmon looks terrific and I love the sound of that pepper jelly glaze! this looks fabulous! 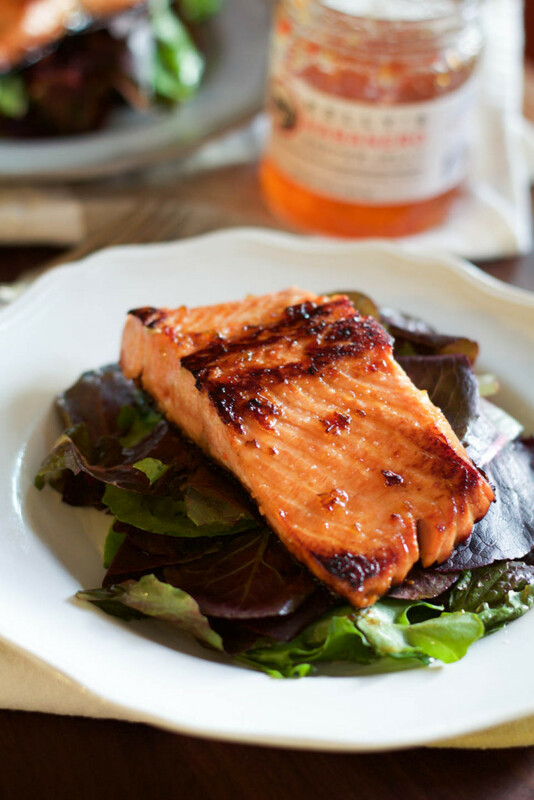 From the fresh looking salmon to that tasty glaze and field greens! I’m on my way over! Loved this healthy dish, thank you! What a gorgeous salmon! I would love to try that jelly… it’s the BEST flavors! Thank you! It is a great local jelly maker, great flavors! What a spectacular piece of salmon! LOVE this pepper jelly glaze!